I'd be lying to say that DJ Hero was not in my running for my 2009 game of the year. In a peripheral wasteland of plastic guitars and drumkits, Activision and Freestyle Games' turntable release seem to come at the wrong time when the genre was at the verge of over saturation. Surprisingly DJ Hero delivered a unique experience with an even more unique soundtrack. 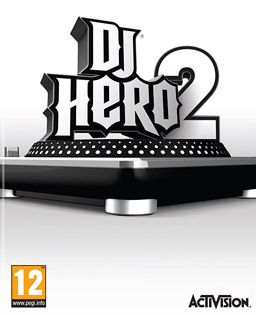 One year later, DJ Hero 2 is taking another shot at it, touting more songs, more guest DJs, more online modes and just more overall. To get the hype train rolling, a demo for the October 19th release hit the Xbox Live Marketplace Tuesday for Gold Members. After nabbing a month subscription, I quickly queued up the demo for one of my most anticipated games for 2010. The demo itself features four of the game's 70 or so mixes. The Pussycat Dolls - "Don't Cha" vs. Pitbull - "I Know You Want Me" and Lady Gaga - "Just Dance" vs. Deadmau5 - "Ghosts 'N' Stuff" are the two mixes available for quickplay. These include mic support for those who want to try out the game's vocal system. The MSTRKRFT - "Bounce" beatjuggle can be played in the battle mode while Estelle's "American Boy" vs. Chic's "Good Time" is the tutorial song. The mixes themselves sound great and are of the same caliber as the ones found in the original. The game itself seems to be taking on more of a Top 40 approach to the setlist, and these mixes reflect that. Starting the demo up, the first thing I noticed was how clean the interface was. Gone are the obnoxious looking graffiti art pieces that filled DJ Hero's main menu. The sequel takes a more minimalist approach, utilizing a lot of white space and black ink splatters. Though it isn't much, its clean look makes it visually appealing. The in-game heads up display has been tweaked as well. The star counter has been turned into a bar that fills up as you score more points. A neat feature is that your previous star count is also marked on the bar, making for a nice indicator for those looking to improve previous scores. My only problem with the new HUD is that it was hard to tell where your euphoria (star power) was and how much of it you had stored. While it may look neat, it could use a little bit of work. The main thing that seemed to be on display in the demo are the game's new freestyle sections. DH2 features sections that allow players to preform their own scratches, button samples and cross fading. Out of the three, cross fading seems to be the most fun and functional. Cutting between the two songs sounds seamless to the overall mix and can lead to some pretty creative sounding results. My only hope is that there is a practice mode that highlights these sections in the final build. That way, it is easier to hear what both sides sound like, enabling players to know exactly when to cross fade. Freestyle sample sections also return, allowing players to spam sound effects to their heart's content. It works exactly like it did in the first one. New to the sequel are song specific samples which are soundbits taken from the mixed songs themselves. Some of the samples are hit or miss and sound awkward when used repeatedly. Once again, a practice mode would be appreciated to perfect how you want to go about these sections. The last freestyle section is pretty underwhelming. Overall, to me were the scratching sections were most disappointing. The scratching itself really just sounds out of place especially compared to the pre-recorded scratches found within the mixes. They also seem to have a lower volume compared to the rest of the song making the whole thing sound kind of awkward. While I can admit this is a welcomed addition, in the demo it didn't seem like its potential was fully realized. Other than quickplay, the second mode found within the demo is the game's battle mode. Here players with multiple turntables can try out Accumulator mode as well as the DJ Battle mode. Single players can just play the latter against the computer. DJ Battle mode is basically the Face-off mode found within the Guitar Hero franchise. Players preform alternating song sections and the player with the higher score wins. While I don't have the means to play with another person, let me just note that the CPU is brutal in the demo. Not prone to many mistakes, if you can't perfect the song sections you really don't have a chance to win. This mode apparently plays a role within the career more and judging by the difficulty, may set a roadblock to players. With that being said, it's still pretty neat to play and made me wish I could test it out online where I might stand better of a chance. Overall, this is DJ Hero. While it may look different, it plays exactly how it did a year ago, albeit with a few new additions that make the experience fresh again. The demo is a perfect taste of what to expect come October 19th when it hits retail shelves. Playing around with the freestyle sections alone should be enough to hold fans of the series until then.